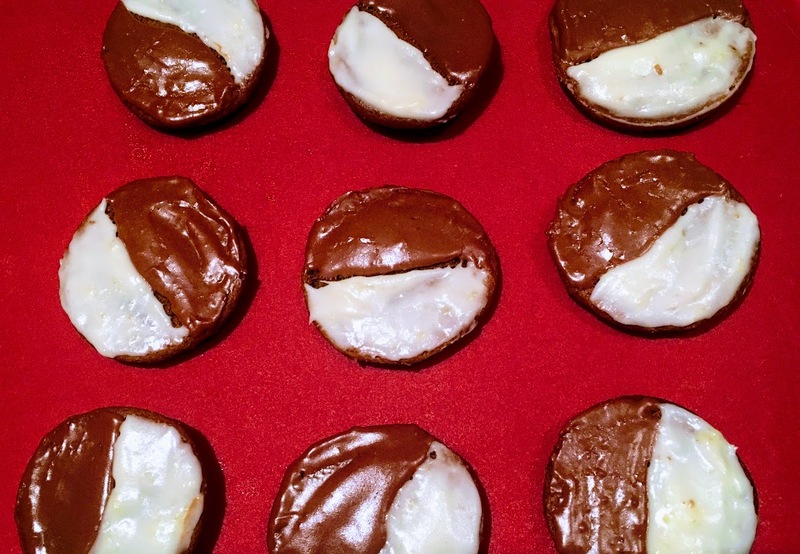 These are black and white cookies with a surprise twist: the cookie underneath is gingerbread, and the lemon and chocolate icings are infused with freshly grated ginger. The idea came to me after a friend and I shared a black and white cookie at a New York City bakery (the cookies are a staple item at bakeries and delis across the city.) It was a cold evening at the start of the holiday season, and I thought: why not create a seasonal variation of the classic cookie with the flavors of ginger and molasses? Spicy and not overly sweet, the dough has a little cocoa powder and a double dose of ginger, both fresh and ground. I formed these into small, bite-sized cookies, which make the perfect winter treat. Prepare the dough: Preheat oven to 350° F and line 2 baking sheets with parchment paper. In a small bowl, stir together baking soda, flour, ground ginger, cocoa powder, and salt. In a large bowl, cream together butter, fresh ginger, and sugar, about 2 minutes. Stir in egg, vanilla, and molasses until smooth. Add flour mixture, stirring until just combined. If dough is sticky, let chill for around 10 minutes or so in the fridge. Scoop tablespoonfuls of dough, roll them into balls, and place them on prepared baking sheets at least 1 inch apart (the dough will spread.) Bake for around 13 minutes, or until the bottoms of the cookies begin to turn golden brown. Set aside to cool. Prepare the lemon ginger icing: In a small bowl, mix sugar and butter. Stir in lemon juice, water, and grated ginger until smooth. Prepare the chocolate ginger icing: In another bowl, stir together sugar and butter. Add cocoa powder, water, and grated ginger, stirring until smooth and creamy. Glaze the cookies: Using a small spoon, spread lemon ginger icing on one half of the cookies, and chocolate ginger on the other half. Serve right away, or store at room temperature in an airtight container.